SÃO PAULO, BRAZIL – It took less than three minutes on Tuesday afternoon, for Brazilian President Dilma Rousseff to receive one of the biggest blows to her administration, with the country’s largest political party, the PMDB, voting to withdraw itself from the government coalition. It took less than three minutes for PMDB leaders to announce the party was leaving the Rousseff government coalition, photo by Fabio Pozzebom/Agencia Brasil. “Starting today, in this historic meeting for the PMDB, the PMDB is withdrawing from the government of President Dilma Rousseff,” said the party’s VP, Senator Romero Juca minutes after the meeting was called into session. The withdrawal of support by the PMDB expands the political crisis within the Rousseff Administration, already plagued with the Lava Jato scandal, wiretapping scandal and allegations of mishandling public finances. The fear, say political analysts is of a domino effect regarding the other allied parties. The PP (Progressive Party), an important ally, has already scheduled a party meeting on Wednesday, March 30th and it is almost certain that it will too leave the coalition. With lingering political support, Rousseff’s attempts to avoid an impeachment process are significantly hampered. “With the PMDB out and other smaller parties of the government coalition having second thoughts on whether to remain on board, there is now a sixty percent chance that Rousseff will be impeached,” stated Carlos Caicedo, Senior Principal Analyst for Latin America for IHS Country Risk consultancy group. According to analysts, with two-thirds of the votes in the Chamber of Deputies required to begin impeachment proceedings, Rousseff will need the all votes of the rest of the allied parties and some PMDB dissident votes to avoid the procedure. In all President Rousseff requires at least 172 votes to halt the impeachment process at the Lower House. Brazil’s VP Michel Temer from the PMDB party will take over if President Rousseff is impeached, photo by Tania Rego/AgBr. The PMDB gave its more than six hundred members currently holding posts in the federal government as well as its six cabinet members until mid-April to resign their positions. According to local media, three of Rousseff’s cabinet, the ministers of Agriculture, Science and Technology and Health, are said to be reluctant in stepping down and may choose to leave the party instead of leaving the government. Tourism Minister, Henrique Eduardo Alves, resigned on Monday a day before the PMDB meeting. Congressional representatives are now wondering how President Rousseff will replace these federal employees, voicing fears of the ‘negotiations’ which may be made so that the President will escape an impeachment process. 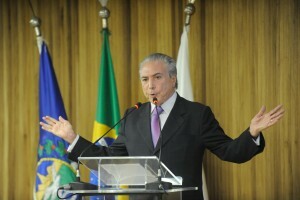 “Unfortunately, this (substitution of employees) may lead to corruption, since the one who leads the country will have to negotiate (with allied parties) individually for the votes to be able to avoid the impeachment process,” PV (Green Party) leader in the Chamber of Deputies, Alvaro Dias was quoted by Globo as saying. Vice President Michel Temer, meanwhile, was on a plane from Brasilia to São Paulo yesterday as the decision by his party (PMDB) was being made. According to local media and political analysts, the VP did not want to be pressured by the government’s PT party or dissidents of the PMDB who are still supporting the Administration. If President Rousseff is impeached, Temer would command of the country until the end of 2018. The PMDB has currently 68 representatives in Congress’ Lower House and eighteen senators, in addition to seven state governors.